Mobutu's political system, inaugurated in 1965 and lasting more than three decades, met all the characteristics of totalitarianism. This study shows that the failures and misdeeds of Mobutu's system were clear evidence that it lacked an African-centred vision and did not put the interests of the African people of Congo (formerly Zaire) at the centre of this political project. In this study Mobutu's political actions in the 1990s - mostly as they related to the National Sovereign Conference - are critically analyzed and found to be a deliberate attempt to obstruct the momentum of democracy for the African people of Congo. From an Afro centric standpoint, this obstruction is evidence of Mobutu's attempt to impede the search for harmony and peace by the Zairian people, and to reject the African-centred truth that without Ma'at (harmony) there is no understanding and no possible restoration of balance. 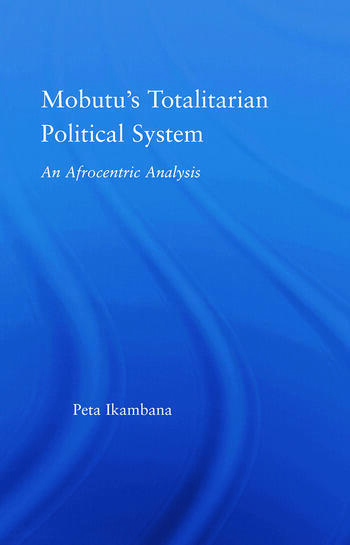 Mobutu's Totalitarian Political System will be of interest to students and scholars of ethnic studies, political science and international relations. Jean-Louis Peta Ikambana is a scholar, social Justice advocate, teacher, social worker, and programs administrator. Dr. Ikambana has worked with Jesuit Refugee Service in collaboration with the UNHCR, Congreso De Latinos Unidos, American Friends Service Committee, a Nobel Prize winner organization, and is also a member of the Academy of Political Science.